PSI's 13th Regional Conference for the Asia Pacific Region (APRECON) and related meetings will be held from 9 to 12 October 2016 at the ACROS Fukuoka conference venue in Japan. On 12 October, the closing day of the Asia Pacific Regional Conference (APRECON) in Fukuoka, around 250 delegates representing more than 70 PSI affiliates from 18 countries resolved to intensify the struggle against the ambitious Regional Comprehensive Economic Partnership (RCEP) under negotiation among 16 countries in the region. Check out our Facebook pages to find out everything that happened during APRECON 2016 in Fukuoka, Japan. PSI's 13th Regional Conference for the Asia Pacific Region (APRECON) and related meetings will take place in Fukuoka, Japan 9-12 October. All documents can be accessed here. PSI has made a block booking for a certain number of rooms at the following hotels from 8 to 12 October 2016. Hotel MyStays Fukuoka Tenjin, Hakata Floral Inn Nakasu Hotel, Hotel Fukuoka Garden Palace and Valie Hotel Tenjin. Invitation to the 13th PSI Asia Pacific regional conference (APRECON) and related activities taking place at the ACROS Fukuoka conference venue in Japan from 9-12 October 2016. PSI's 13th Asia Pacific Regional Conference and related meetings draft programme is available for download in English and Japanese. The Conference participation form/s inform us about your delegation and status. Three participation forms are available for your download, please submit the relevant one. Let’s make this meeting a safe environment! No to sexual harassment! 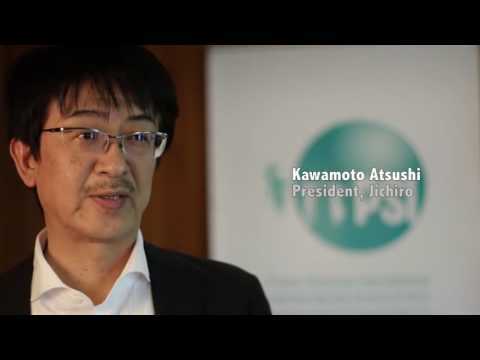 JICHIRO President, Kawamoto Atsushi, invites you to ‪APRECON‬ 2016 in Fukuoka, Japan, 9-12 October. See our website page for more information on APRECON.